We are a social, fraternal, charitable and patriotic organization for veterans who have served or are serving with the 11th Engineer Battalion. 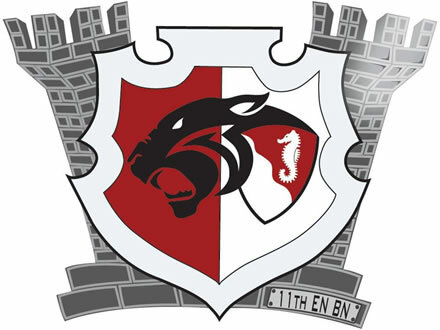 The Panther Press, published three times a year, is the official newsletter of the 11th Engineer Battalion Association. You can access and download the current issue of the Panther Press here. Archived editions can be found at the Panther Press tab above. The 2016 Reunion will be held in Chesapeake, VA from 13 - 17 October. Highlights include day trips to Colonial Williamsburg, Jamestown, Yorktown, Fort Eustis, Virginia Beach Boardwalk and a Memorial Service at either MacArthur Museum or at the Newport News Harbor. Access & download the Registration Form and latest info at the Reunions tab. Membership is available to all who served in the 11th Engineer Battalion as well as surviving spouses.